Parts, accessories, magazines and maunuals for the UZI sub-machine gun. 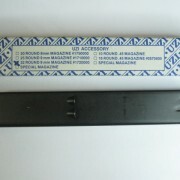 UZI 32 Round Magazine. NOS in Action Arms Box.